On a scale of 1-10, how excited are you for the upcoming Skyrim Together? 0 - Why is this even an option? 1 - Much less than excited. 2 - Not looking forward to it. 3 - Could care less. 4 - Don't have any expectations, good or bad. 5 - Could be interesting. 6 - Caught my attention. 7 - Not going to jump on any hype trains, but it looks fun. 8 - Very interested to see what happens with it. 9 - Excited to see where it leads! 10 - Can't wait, sign me up! Has anyone else seen anything on this? I literally just stumbled across it and I'm already hyped (though also skeptical). To be honest, though, even if it came out worse than expected, it would probably still be infinitely better than everything I've seen on Fallout 76. Would anyone be willing to get a group together to play this if and/or whenever it came out? EDIT: Streamed the game and recorded some of the gameplay. Just a disclaimer, this is completely unedited. Comment below with your username and I'll add you to the list! been patreon supporter for about a year, these guys are great. the closed beta is available for patreon supporters minimum of 1$. some features are missing like synchronized item physics and item trading, but are confirmed to be there outside of closed beta. the closed beta has only inhouse servers which are located in the EU (and allow up to 13 players), which means NA will lag but it's still playable. you can host your own servers outside of closed beta with up to 64 players. theres still quite some connection bugs but most are easy to solve on the spot like using F5 to quicksave and reload players. Skyrim Special Edition is required to play this mod, it doesnt work with Oldrim yet, Skyrim VR works with this mod but it isn't supported. 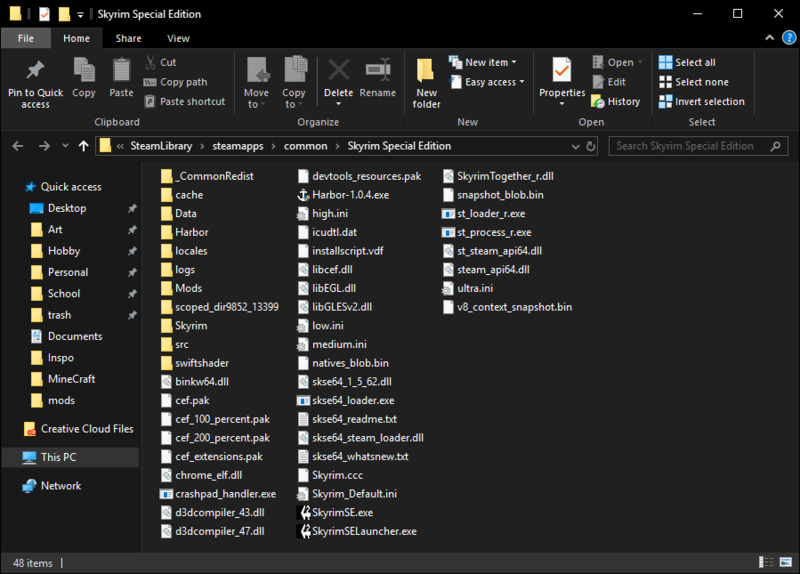 here is a screenshot of how your skyrim folder should look with Script Extender and Harbor (Together's client) inside. I went ahead and signed up for it because why the heck not, might as well. If anyone wants to hit me up, I'm going to try streaming it. Got into the closed alpha by sheer luck and have been on/off testing this with another discord user. It's nice, connecting to another player is flawless. No port forwarding/stuffty router fiddling. Everything is streamlined for player convenience. I've been downloading and testing a slew of mods and cataloging them on which mods work vs which mods don't work. Since Vanilla skyrim is broken in some aspects, which would make multiplayer vanilla skyrim unplayable, here is a list of workable mods that don't change much, but improve on the base game to the point where it's actually playable and enjoyable with others. Starting with Clothing mods. The clothing in skyrim is limited. Bandits always wear the same iron/fur/steel preset armor. It's annoying, so we're changing that with this little mod. *Immersive armors - adds many new vanilla styled armors to skyrim, completely balanced, completely safe to use with Skyrim Together, doesn't conflict with anything on the list and integrates nicely with one of the perk mods we'll be using. *Bandoliers and Bags - Adds new Craftable Bandoliers and Bags that increase your carrying capacity by 15-70 points. Can wear multiple bags on your armor giving it some pop. Doesn't conflict with anything. *Ordinator - Honestly if you're not using this, you should be. The Perks in Vanilla skyrim don't do anything to change your character drastically, like a perk should. There are multiple trees in one perk tree that allows you to tailor your character to your liking. Want to be a battlemage? Can't because Skyrim's limiting perk system? That changes now. Want to be an archer and be rewarded for fast accurate arrows or long distant snipes? Ordinator perk system. Compatible with Skyrim Together and doesn't break anything. *Mortal Enemies - Stops your enemies from tracking your every movement with their weapon. When they swing they won't correct their aim when you step out of the way. The same goes for you, so you have to commit to an attack and so do they. As far as I can tell this works. I've tested it and noticed a few times the enemy kinda freaked out when two people were near it, but i'm going to attribute that to Sky-Together's state of development. *Ultimate Combat - Polishes the Combat of Skyrim. You're rewarded for timed blocks and timed attacks rather than just spamming power attacks and shield bashes. Works for you and the enemy. Lower level enemies don't utilize the mod very well but higher level enemies do. Also reworks some of the enemies to be more of a challenge. Dragon Priest's and Dragon's come with a few new attacks and are overall smarter/stronger. Dwarven Centurions come with new attacks. Groups of enemies work as a cohesive strike force utilizing their strengths and compensating for their weaknesses respectively. *Apocalypse Magic - Must have magic mod. Makes Mages playable. Overhauls some spells and adds huge trees of completely new ones. *Immersive Weapons - Same mod author of Immersive Armors. Adds many new and expands upon existing weapons in skyrim. All perfectly balanced. *Tk Dodge !! - EXTREMELY EXPERIMENTAL !! So this may or may not work. I've tried to use TK dodge, but it requires FINIS, an animation extension mod. It's really finicky and it's prone to making you and your partner de-sync like crazy. 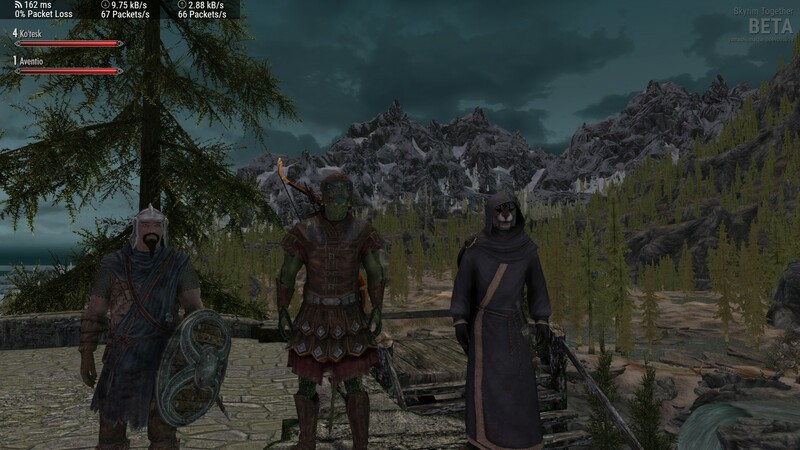 *SkyUI - Not only required for Skyrim Together, overall UI improvements. *Unofficial Skyrim Patch - Fixes a lot of the bugs that Bethesda left in over their 22 reiterations of skyrim. *Floral Overhual - Makes the game look prettier by adding in flora over clear areas. That's pretty much it, that's as far as i've gone mod wise. I'll be testing more later down the road. BUMP: Just updated the topic, added a poll, a video, and a username list! How did this take 8 years to make? game development takes time, especially when the actual creators of the engine and game claim the achieved feat was "impossible". also one thing that made it “impossible” was cause skyrim was designed to be single player, and singleplayer games tend to make a lot of assumptions that arent true on multiplayer games (and thus are extremely hard to reengineer to make multiplayer). one example is quest data - usually global flags are used to determine status on a quest, but for multiplayer youd have to assign these flags to a client and use those instead. 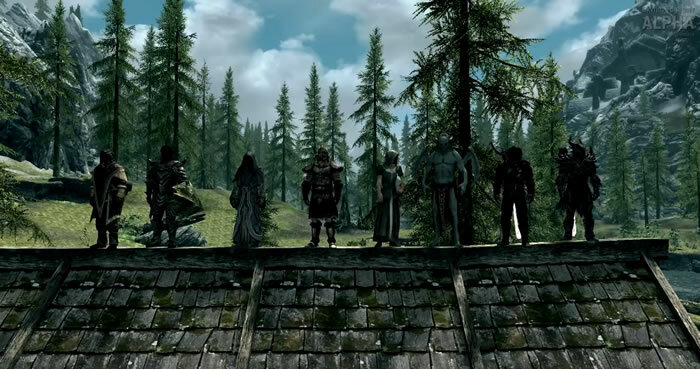 although not difficult per se, its a huge amount of effort considering how many quests there are in skyrim and all the possible way they interact with the world.